There’s this pervasive idea that science is somehow exempt from the ugly political world in which the rest of us wallow. But even a perfunctory look at the history of American science shows that this hasn’t always been the case—and the circumstances that pushed scientists into the public sphere in the past aren’t that different from those scientists are facing today. Since Trump’s election, many scientists have found themselves in an unfamiliar position: actively advocating for their work, their jobs, and the very idea of free scientific inquiry. Scientists are mobilizing and organizing en masse, planning marches and running for office. They’re pushing back on potential nominees and boycotting conferences. Kelly Ramirez, a microbiologist and one of the founders of the 500 Women Scientists network, never thought of herself as an activist before. “I had my head down,” she said. “You do your work, you publish your papers—it’s not encouraged to take political positions.” But after the election, she realized that she had to take a more active role. “Now, it’s a good time to start being louder,” she said. Scientists haven’t always been as disengaged from the political world as many think they are today. “Scientists were at the forefront of much of the social change that was taking place in the US between the 1930’s to the 1980’s,” said Peter Kuznick, director of the Nuclear Studies Institute at American University. They advocated for the same kinds of things that today’s protesting scientists are talking about: open, unfettered, uncensored research; funding support; and ethical responses to problems that science identifies. In the early 20th century, scientists were in a pretty good position. They were popular; they were well-funded by both public and private money; they were stars in the eyes of the public. Many were loath to do anything that might endanger either their perceived objectivity or their sources of funding. This studied avoidance extended up into the professional societies, such as the American Association for the Advancement of Science (AAAS), which shrank away from engaging in political issues. During a 1919 meeting, the AAAS leadership suggested that “that sectional officers avoid placing on their programs’ papers relating to political questions on which public opinion is divided” (sound familiar?). This disengagement didn’t—or couldn’t—last. The crumbling economy of the 1920’s left thousands of PhD’s unemployed and government funding for research slashed. Most importantly, science lost some of its luster in the eyes of the public. Kuznick explains that the public blamed science (and technology) for the economic collapse. People thought the advancements in technological capabilities, so entrancing in the previous decade (and for which scientists had gleefully taken credit), had led to “technological unemployment,” job loss, and economic ruin (sound familiar?). “The things they had been lionized for in the 1920’s, they were being castigated for in the 1930’s,” Kuznick says. Scientists realized that if they wanted to regain the country’s respect, they would have to think deeply about their role in and responsibilities toward society. Later that year, the prominent anthropologist Franz Boas authored “Manifesto on the Freedom of Science” denouncing fascism and calling for scientists to recognize their moral obligations both as researchers and as citizens; nearly 1,300 scientists signed it. At the same time, though, some scientists thought that their work on war-related issues was an ethical requirement: only with their research would the war come to an end. Manhattan Project physicist Joseph Rotblat and others resigned from their positions because of moral or ethical concerns. Other Manhattan Project scientists kept on doing the research necessary to develop atomic bombs. By the end of WWII, many American scientists—not just the nuclear physicists of the Manhattan Project— recognized that they had been implicitly or explicitly linked to the atrocities committed during the wars. “The physicists have known sin,” said the eminent physicist and director of the Manhattan Project, Robert Oppenheimer, “and this is a knowledge they cannot lose.” Chemists had produced horrifying agents of chemical warfare. Biologists and doctors had tested those weapons on black and Puerto Rican troops, as well as Japanese-Americans. Many spent the rest of their lives trying to make up for their involvements. “Many prominent scientists involved in research that led to the development of the atomic bomb expressed regret,” said Al Teich, the former Director of Science and Policy programs as AAAS. (Others didn’t). “They organized to favor and encourage disarmament in the world,” advocating for thoughtful, ethical reflection in the scientific process—and more concretely, for legislation that would prevent an escalating nuclear arms race. Manhattan Project scientists founded the Federation of Atomic Scientists (now the Federation of American Scientists), which explicitly advocated against further nuclear war. Commoner’s social-scientific activism was baked into the research he and his colleagues at the Center undertook. For example, in the 1950’s, scientists around the world were wondering how aboveground nuclear testing affected public health, but the official message from the US government was that the risks from fallout exposure were minimal. Commoner and his colleagues coordinated with a group of citizens from St. Louis to develop a comprehensive study showing that radioactive fallout from nuclear tests was making its way into American children. He eventually pushed that data all the way through the corridors of power, to President Kennedy’s desk. Shortly thereafter, Kennedy signed the Partial Nuclear Test Ban Treaty. Many of the other projects of Commoner and his colleagues served as templates for how scientists could involve themselves in questions that mattered, politically and socially. (Commoner also, very unsuccessfully, ran for president). Scientists’ forays into public advocacy weren’t always welcomed. In many cases, the scientific community shunned their own for participating in “activist science,” which many thought weakened their brand. For example, several biologists testified in the 1958 Long Island trial in which plaintiffs claimed DDT spraying in their town had caused unacceptable health effects. In doing so, “they aroused the wrath of the scientific community, because [other scientists] felt that advocacy was not something scientists should or could do,” said Mark Lytle, a science historian at Bard College. 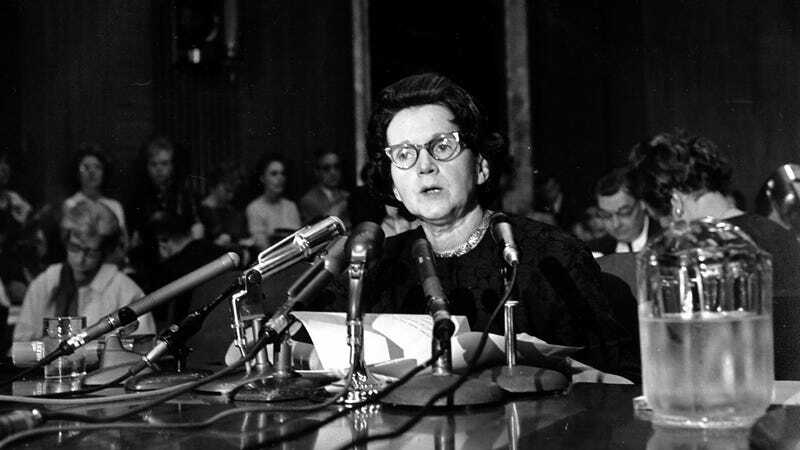 Only after biologist and writer Rachel Carson collated thousands of similar studies into a coherent story (told in her book Silent Spring) did the public health community recognize that they might have a role as public advocates as well as researchers. Political engagement continued to rear its head in the scientific community, periodically, throughout the 1970s and 80s, from universities and professional societies like AAAS opposing the use of chemical weapons in the Vietnam War, to scientists like Carl Sagan debating the ethical and practical dangers of nuclear weapons during the Reagan years. Then in the late 1980s, another issue snuck into the politico-scientific world: climate. In 1988, then-NASA Goddard Institute for Space Studies head James Hansen told Congress that “with 99 percent confidence we can state that the warming [observed between 1950 and 1988]...is a real and warming trend.” He also told the New York Times that “it is time to stop waffling so much and say that the evidence is pretty strong that the greenhouse effect is here.” The conversations around climate change would drive much of the politico-scientific activism of the 1990’s and 2000’s. Since the 1990’s, public trust in scientists started eroding again, particularly around subjects like climate, GMO research, vaccine research, and fetal tissue research. “There’s increasing distrust of science during this period,” Barrow said, “as the public began to fear that it was being co-opted or distorted.” Many scientists felt the funding pinch as their subjects grew politically controversial. Others saw their work twisted, discounted or discredited. In some cases, this pushed scientists to lobby harder and speak up louder, but in many other instances, scientists backed away from political engagement. And now what? Scientists are back in a position they’ve been in many times before, in which they might have to voice their political views, both to ensure their own survival and as an ethical necessity. “The level of activity I’ve seen in the past few months has been incredible,” Teich said. “I haven’t ever seen scientists get this worked up before.” Kuznick said that the level of organization is reminiscent of the 1930’s—or beyond. US scientists are planning marches, running for office, speaking publicly at meetings, and reaching out to the general public. They’re trying to make their way back into the political world they’ve inhabited before. “The idea of the disinterested, removed scientist is dead everywhere except in pop culture,” said Egan. “The public still thinks that’s what a scientist is...but closing yourself off in the lab is no longer an option.” Kelly Ramirez, like scientists across the country, recognized that right away on the morning of November 9th, and in the wake of the election, she and many other scientists like her knew exactly what they were going to do: organize, resist, and advocate for science. Alejandra Borunda is a science journalist and climate researcher at Columbia University’s Lamont Doherty Earth Observatory.